1One should pause at this time in our collective history to ponder where the Black Literatures of Africa, the Americas, the Caribbean, and increasingly of Europe, would be without the exhaustive work of the French scholar, Michel Fabre. (He has also been in the forefront of broad-banding the several other post-colonial literatures in English so often ignored except for special authors by the English and American establishments. 2He’s been doing this since some of his contemporary detractors were in knee pants, and with determination and drive before and since the publication of his first of several major works in 1973, The Unfinished Quest of Richard Wright, written over a period of twelve years. The work follows the lead of André Malraux, Jean-Paul Sartre and other French literary figures in resurrecting Wright’s diminishing reputation at home, though he had died in 1960 at only 52. 3Fabre’s generosity of spirit is widely known, and often underappreciated. And if he was not the head of an organization, scholarly or otherwise, he was an active member whose international reputation usually earned the focus of a spotlight. He’s hosted several notable conferences at the Sorbonne and for the African American Music and Paris 1996, he helped to arrange for the concert performance of an opera for which I’d written the libretto; Vanqui premiered in the U. S. three years later with Rodrick Dixon, Marietta Simpson, Carmen Balthrop, Benita Valente and twelve other performers. 4In 1963 I met Michel Fabre over the sick bed of Chester Himes in Columbia Presbyterian Hospital on upper Broadway in New York. Himes had spoken often and with warmth of this slender, bespectacled young French teacher. Himes had come from the Yucatan from where he had written to me of being bitten by a scorpion and had to get immediately back to New York for treatment. As frequently happened, some weeks earlier he had arrived from Paris on his way to the Yucatan which he claimed he could not get to unless I lent him some money. I did, as usual, (he always paid it back) and he was off to see a friend. 6Fabre and I began an irregular correspondence, so much so that I do not recall when next we met. He was writing and collecting materials for his big book on Wright and, I suppose, just as it is in the U.S., climbing the academic ladder to a full professorship. He was well on his way to becoming the pre-eminent European scholar of his time on African American literature and its relationship, particularly with France, as his From Harlem to Paris. Black American Writers in France, 1840-1980 (1991), firmly establishes—along with the frequent visiting professorships in the U. S. that Fabre so deftly fields. He is generous at securing such posts in France for African American scholars of the literature. 7Most of my time in Europe bas been spent in Spain, not France, and although I’ve often stopped in Paris, it was not, it seems, until relatively recently (some 20-odd years ago), that I met Fabre and his wife Geneviève there, or met them in New York while they were with Claire and Ed Margolies, a friend and also an African American literature scholar. 8To Fabre I owe thanks for securing translators as well as publishers for two French editions of The Man Who Cried I Am (1967, U.S.; France, 1994, 1999). I have had the pleasure and honor to have him speak at the Rutgers University Newark campus before I retired from there, and I’ve attended at least three conferences at which Fabre was present, two at the Sorbonne and one on the Canary Island of Tenerife. He may have aged like the rest of us, but he remains an astonishing bundle of intellectual energy with which he battles his Parkinson’s every step of the way. 9I also owe him thanks for being just Michel, a very special, unassuming scholar who is first and above all an extraordinary human being. 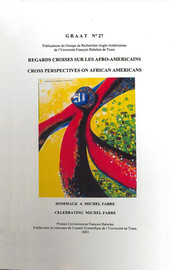 WILLIAMS, John A. Fabre: a Tribute In : Regards croisés sur les Afro-Américains : Mélange en l'honneur de Michel Fabre [en ligne]. Tours : Presses universitaires François-Rabelais, 2003 (généré le 22 avril 2019). Disponible sur Internet : <http://books.openedition.org/pufr/4172>. ISBN : 9782869064690. DOI : 10.4000/books.pufr.4172. Williams, John A. “Fabre: a Tribute”. Julien, Claude. Regards croisés sur les Afro-Américains : Mélange en l'honneur de Michel Fabre. Tours : Presses universitaires François-Rabelais, 2003. (pp. 139-140) Web. <http://books.openedition.org/pufr/4172>. JULIEN, Claude (dir.). Regards croisés sur les Afro-Américains : Mélange en l'honneur de Michel Fabre. Nouvelle édition [en ligne]. Tours : Presses universitaires François-Rabelais, 2003 (généré le 22 avril 2019). Disponible sur Internet : <http://books.openedition.org/pufr/4146>. ISBN : 9782869064690. DOI : 10.4000/books.pufr.4146.